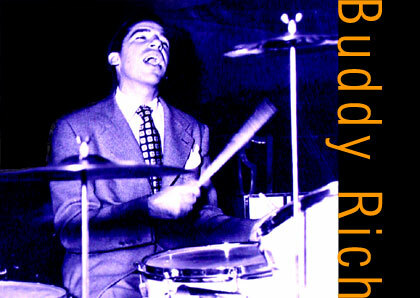 Buddy Rich CDs @ Hep Records, jazz in depth from the 1930's to the present day. Bernard "Buddy" Rich was born into a vaudeville show business family on September 30, 1917. His father gave him a little drum kit and by the age of four was billed as "Traps, The Boy Drum Wonder". The Rich family act toured extensively including an Australian trip in 1924. They survived the depression years by which time Buddy had become an accomplished tap dancer. His full potential as an all-round entertainer as part of the 1936 show "Oh, Say Can You Sing" was commented upon in the Chicago Daily News. There were more theatre tours till at last in New York in October 1937 he joined the Joe Marsala Combo as regular drummer. His reputation soared and a year later he joined Bunny Berigan's band where he met tenor saxman Georgie Auld. The two extrovert jazzmen hit it off and next found themselves in the Artie Shaw Orchestra which was about the top band in the land in 1939. When the Shaw band broke up the drummer was invited to join Tommy Dorsey who promised Rich that his band was about to be remodelled along Jimmy Luceford lines. Rich accepted and for the next two years became a star attraction and also met and fought with Frank Sinatra. In 1943 Rich joined the U.S. Marines till medically discharged in June 1944 whereupon he rejoined Dorsey. The next twelve months were a little tense as Rich made no secret of wishing to form his own band but was bound by contract to remain with the trombonist. At last Dorsey relented and with a loan from his erstwhile sparring partner Frank Sinatra the Buddy Rich Orchestra was formed in December 1945. 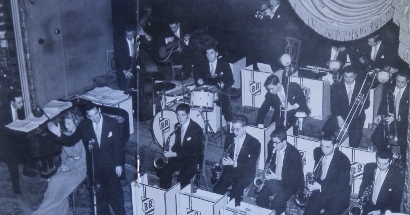 The new orchestra was a wild extrovert unit with Eddie Finckel, Neal Hefti and Billy Moore Junior arrangements which pleased jazz fans although a general appetite for this was waning in favour of the singers and in December 1946 it broke up. In April of the following year he reformed with a declared policy of being more commercial and with his singing as a feature. The reviews were encouraging and it seemed as if he had the right balance. Unfortunately a situation arose where some players wanted to play hot all the time and the ballroom operators didn't with Rich caught in the middle. By the time they returned to New York in October 1948 the band was in crisis and broke up two months later. The drummer joined the Les Brown band, moved to the J.A.T.P. organization and in the fifties was one of the highest paid sidemen in the business playing first with his old boss Tommy Dorsey then Harry James. It was while he was with James in Las Vegas that the leading bug bit him again and he reformed an exciting new band. In 1966 the rock era was well entrenched but the drummer adapted his technique and could out rock any band in the land and toured throughout the U.S., Japan, and Europe. The exertion of such a schedule eventually brought on heart problems which were successfully treated in 1983. He was soon back on the road leading another great band filled with eager young talents and again undertook punishing overseas tours. Then in late 1986 he was diagnosed as suffering from a brain tumour. He bravely underwent surgery but the strain was too great and three weeks later on April 2, 1987 his heart gave out. His funeral service in Hollywood brought out a huge gathering of showbusiness greats including Sinatra, Mel Torme, Sammy Davis Jnr, Jerry Lewis, Mel Brooks, his old boss Artie Shaw and many others. Rich is by general consent the most phenomenally gifted percussionist that ever lived whose ability to span the stylistic changes from the 1920s to the 1980s are beyond belief. Buddy Rich - "Daily Double"